Ed. Note: With a misplaced keystroke, we accidentally published this post a few days early. Our apologies for teasing your RSS feeds without delivering. Fitting, considering content of the post. Anyhow, enjoy! 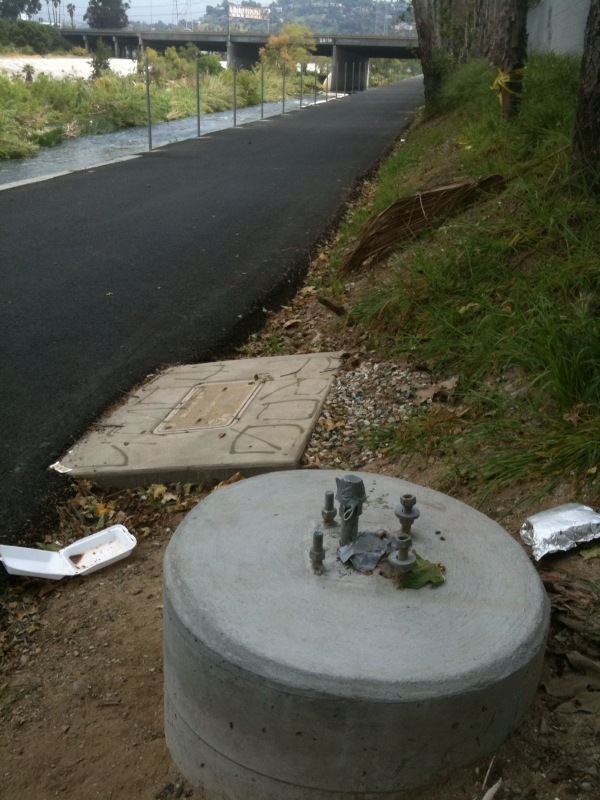 So there was a recent post in The Eastsider LA (also covered in L.A. Creek Freak) about the newly paved section of bike path running through Elysian Valley. We’re pretty excited about the bike path too. 2.5 more miles of bike path along the L.A. River is always something to be happy about. Even better, the 2.5 miles connects to the existing Glendale Narrows bike path, creating 7.1 miles of uninterrupted bike path along the LA River. Eventually, we’ll connect those 7.1 miles all the way down to Long Beach. But as happy as we are about the bike path, it still isn’t finished yet. I know it’s way tempting to hop on your bike and get a whiff of that “new bike path smell”, but the area is still a construction site until the lights are installed (our source’s best guess is that this will take place sometime in late April and we will let you know as soon as we hear anything!). 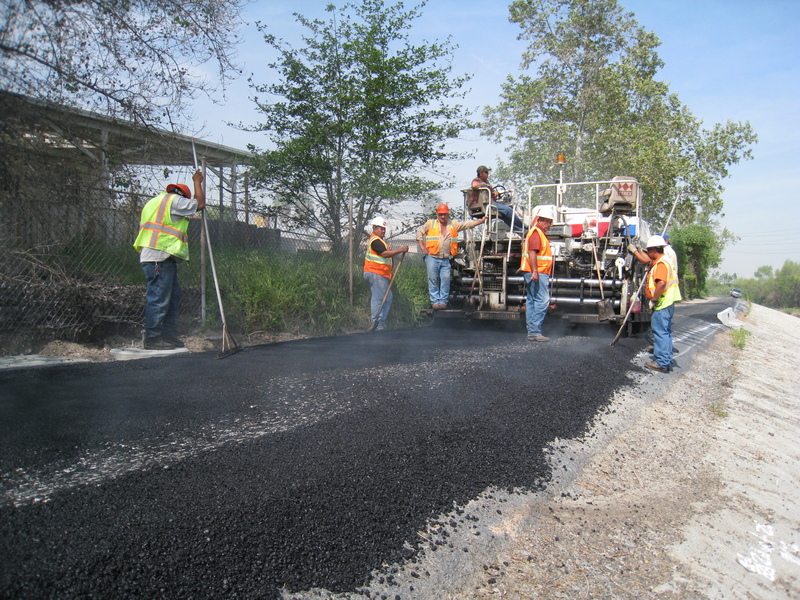 There’s still construction equipment out there, workers are on the job, and asphalt is still being poured and smoothed. We wouldn’t want any bicyclists to take a test run and wipe out before the project is finished. You might be asking why there is a delay in the first place? The target completion date was originally scheduled for February 2010, after all. Our insider mentions two hiccups. First, there were delays due to weather. The rainy weeks that took place in January and February really threw a wrench into the construction schedule. Second, Public Works Bureau of Street Lighting needed to switch the existing lights to an LED package. The original contract called for standard lights. And why didn’t we just use solar lights? The major problem with the solar lighting package was that we would have to cut down a lot of trees in order to have solar lights. Solar lights would have been preferable, but cutting down trees in order to install them seems to defeat the purpose. Instead we went for the next best thing: LED’s. So there you have it: due to a wetter than usual winter and changes to the lighting, the project is delayed! Our bad, guys. Tough to swallow, but we’re just asking for a little patience. LADOT Bike Blog will be one of the first people out there to trumpet Elysian Valley bike path’s grand opening (and we’ll probably be one of the first riders on it!). I hope you’ll be able to make it too. Keep an eye out here for an official opening date. /wp-content/uploads/2010/03/missing-lights11.jpg 300 225 cyclist http://bike.lacity.org/wp-content/uploads/2015/04/tempBikeLogo2.jpg cyclist2010-03-31 19:25:332015-09-12 00:58:59Elysian Valley Bike Path: Almost there! What questions should the Mayor answer at the Bike Summit?